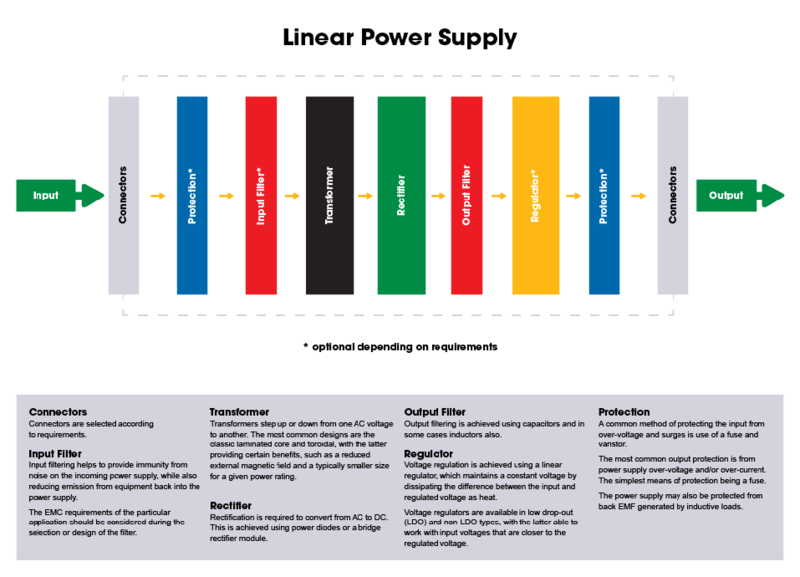 In a linear power supply system, mains power is supplied to the transformer via input filtering, which helps to provide immunity from mains-borne noise whilst also reducing emission back into the mains supply. The AC voltage output from the transformer is rectified, before being filtered to remove ripple, which is typically achieved using one or more electrolytic capacitors. A regulated linear power supply also has voltage regulation in order to maintain a constant output voltage as the AC input line voltage and load current varies. Unregulated power supplies do not have this and their output voltage can vary by a much greater degree. Protection is optional and can protect both the power supply and connected equipment from faults in either of these.